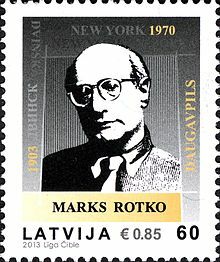 Mark Rothko (September 25, 1903 - February 25, 1970) was a Latvian-American modern artist. He was born in a part of the Russian Empire that is now in Latvia, but lived in America for most of his life. He was Jewish. He committed suicide in New York City, at the age of 66, by taking an overdose of anti-depressants and slashing his arms with a razor. His most famous work is known as abstract expressionism or color field painting. In 2012, one of his works sold for $86.9 million. Rothko's work matured into rectangular fields of color and light. However, between the early period, and the later fields of color, was a long period of transition, marked by two important events in Rothko's life: the onset of World War II and his reading of Friedrich Nietzsche. "I realize that historically the function of painting large pictures is painting something very grandiose and pompous. The reason I paint them, however . . . is precisely because I want to be very intimate and human. To paint a small picture is to place yourself outside your experience, to look upon an experience as a stereopticon view or with a reducing glass. However you paint the larger picture, you are in it. It isn’t something you command". He even suggested that viewers position themselves as little as eighteen inches away from the canvas so that they might experience a sense of intimacy, as well as awe, a transcendence of the individual, and a sense of the unknown. ↑ Baal-Teshuva, Jacob. 2000. Mark Rothko, 1903-1970: pictures as drama. New York: Taschen, p39. ↑ Weiss, Jeffrey (1998). Mark Rothko. Yale University Press. p. 262. ISBN 978-0-300-08193-0. This page was last changed on 31 August 2017, at 07:29.